Obviously, it's all about your preferences. "Personally I found the audio to be a little front-heavy - so I faded it halfway to the back, boosted bass and treble slightly. I have Immersive turned to high since it enables the A-pillar speakers, writes user dirtyfries in a discussion on the subject on Reddit. He says this setting may not sound very 'audiophilic,' but suits his taste. Few other people say that they also fade the audio to the back a little bit. They generally think that the Model 3's original audio settings are a little "front-heavy," liked it was mentioned in the comment above. Another Model 3 owner commented and added that besides fading the audio to the rear a bit, he also baselines the other levels in the EQ to be flat, and then tweaks from there. "I'll echo this, I like a front stage, but it's too dominant in Model 3 unless you fade it about 20% rearward," writes another user in the discussion, named Jpbeans. Engaging the two front speakers makes a difference too. 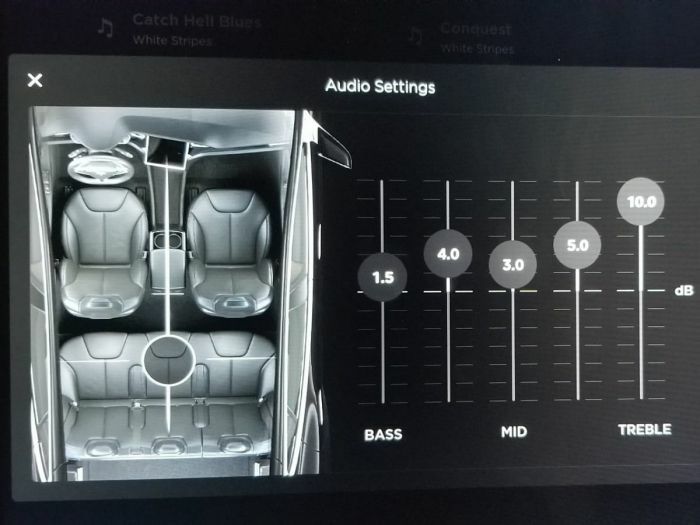 In other words, whether you find the audio of the Model 3 to be front-heavy or not, depends if you engage the two front speakers or not, which helps with boosting the surround effect. For Jpbeans, whom we quoted one paragraph above the bass is solid. "If you have had really good bass before, it's not "great." Anyone that has put a sub in their car in the past will still want to. Those who haven't, will be very happy with the stock bass performance. The very high end might benefit from better drivers, because it falls off a bit on the top, he concludes. If your ears are untrained you may think Tesla Model 3's sound system is great, but if you had modified settings in your previous cars, you may want something different. Here is a setting that Ian Field, a Tesla Forum member, suggested for his Model 3. This can probably work well in the Model 3 too. Phone/source settings: EQ off, no sound enhancements. What are your favorite Model 3 audio settings for overall best sound quality? Please share your thoughts in the comments section below and let's discuss. The audio setting is pretty good in my 17 Volt. Definitely sounds better after the speakers "break in". I would say that I wish the highs were a bit crisper. As far as fade, I have everything centered but I may play with it a bit to see what it sounds like. Thanks for sharing this. Its the only thing I was disappointed with in my 2012 Volt I think its because of the placement of the tweeters so I find it hard to get a nice balanced warm sound all my previous cars' stereos sounded better. That said its not so bad that I've bothered to tweak anything besides EQ. My EQ settings are in a V pattern. Probably my age. When you get older, it’s harder to hear the highs and the lows.